Clashes between Birmingham student protesters, police and security staff have led to allegations one student was headbutted and two others were punched. 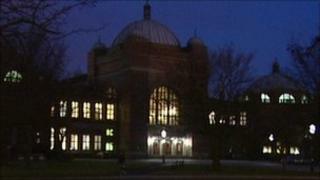 A female Birmingham University student has complained to West Midlands Police she was butted by an officer. The force said there was an accidental clash of heads as officers assisted university security staff to deal with "abusive and un-cooperative" students. The students were protesting on Monday about redundancies and budget cuts. About 20 people started a sit-in at about 1100 GMT on Monday. It ended in clashes at about 1845 GMT. Three students are said to be seeking advice about taking legal action. The students were protesting about the university's plan to axe 200 out of 6,000 posts by 2014. The university said most of the job cuts would come from voluntary redundancies, but the protesters said the cuts were unnecessary as the university had a £20m surplus. Some protesters had tried to let other students into the occupied building but were stopped by university security. A spokesman from the University of Birmingham said: "The occupation of the social learning space in the physics building came to an end at around 6.45pm at the point that protesters charged at security staff without warning, putting the safety of staff and students at risk." The students deny that allegation. "Six security guards, supported by two police officers, then moved forward into the occupied area. "A number of protesters chose to leave - those that had initiated the charge at security guards were actively escorted from the building," the university spokesman said. West Midlands Police added: "Students were abusive and un-cooperative and several students were pushed. "Police went to assist security staff and an officer accidentally clashed heads with a student. That student then called police at 6.47pm to report an assault." Edward Bauer, a 22-year-old geography student who was among those protesting, said: "The protest was ended by force and not initiated by us. "There was no reason for us to charge the security because it was in our interest to stay there." He said when security staff and police "charged through" the open door the students linked arms and formed a human barrier to stop them from entering. One girl was headbutted, another was punched in the chest, and another was punched in the face, he said. The rest of the students either walked out voluntarily or were escorted out by security and police.